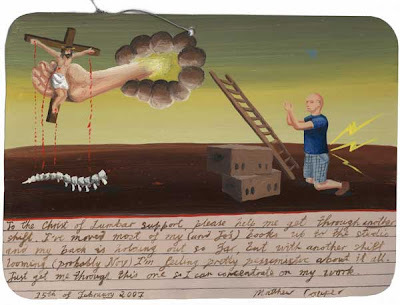 A MOVING EX-VOTO ABOUT SHIFTING. THIS ONE WAS PAINTED JUST AFTER WE MOVED OUT OF TYLEE COTTAGE, WHANGANUI. I'M OVER SHIFTING, HAVING MOVED THIRTEEN TIMES MYSELF, PLUS ALL THE TIMES I'VE HELPED OTHER PEOPLE SHIFT.